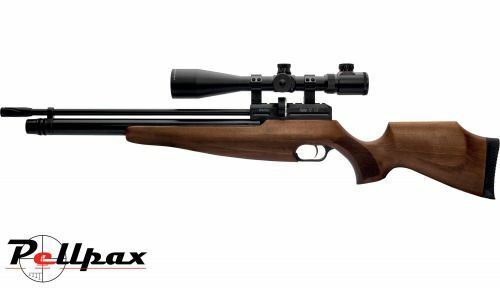 This mid priced PCP rifle is made by Webley, a brand synonymous with quality that has a pedigree of producing some of the most versatile air rifles in the industry. This versatility is well represented with the Raider with enough power to take care of garden pests and the accuracy to take out targets downrange, the raider is a rifle that can do it all. The Raider is equipped with an attractive walnut stock that is ambidextrously shaped and is chequered around where the hands are placed for enhanced control. The rifle is fitted with a muzzle break and comes complete with magazine and fill adaptor. Scope and Mounts sold separately.